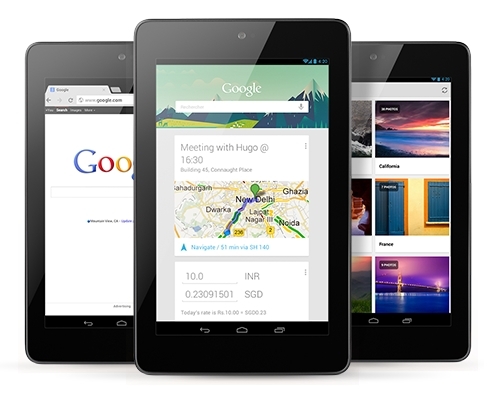 Google's Nexus 7 Android tablet now available in India. The device currently listed on Google's play store for sell at Rs. 15,990 and shipping charges extra according to region of the user. User can place orders these days but Shipping of this product start on April 5, 2013. It is the second launch of Nexus 7 in India. In Nov 2012, the company Asus manufacturer of the tablet start selling limited quantity of the tablet via Croma Retailer Store for Rs. 19,999. Nexus 7 was announced in June 2012 and start selling from mid-July. Nexus 7 sports a 1.2 Megapixel front camera that is usable for making online video call's. Other feature is it has 16 GB of internal storage space and Wi-Fi (802.11 b/g/n), Bluetooth, NFC (Android Beam), GPS enabled. Nexus 7 powered by a 4325 mAh rechargeable battery that gives up to 8-hrs active use. Nexus 7 comes with all of Google’s best in class Apps like G-mail, Chrome, Google+ and YouTube all in the palm of your hand.